In prime condition and perfect to move straight into, this Immaculate Single Level Entertainer is an ideal purchase for new families looking for a property that offers suitable play space for the kids. Or those downsizes wanting comfort and that extra movement area to walk around , without feeling cramped. Designed with 4 bedrooms all complete with built-in wardrobes, this near to new home is well proportioned and easy to navigate when you got to chase your kids around, or have guests staying over. The pristine and deluxe master bedroom comes with a walk-in and sleek ensuite that is designed for comfort and style. While the second bathroom is conveniently located near the living areas, for use of other family members or guests. If you are the type that enjoys to entertain your family & friends, then you will fall in love with the open plan living and dining areas. Complemented by Bi-fold doors that allow you to open up to the outdoor area. You can stretch out the entertainment space from the lounge room to an open deck, allowing more of that natural light into an already beautifully lit home. Perfectly positioned the kitchen looks over the living space and out onto the deck, providing a great view for the busy parent whom is cooking and watching over their children. Coming with plenty of storage space for the dry goods and finished with a stainless gas stove and stone benchtops, the cooking and food prep area are ergonomic in design and flawless in style. Sitting out on the deck in the back entertaining space looking over the charming lawn, one can’t start to help but drift off into a peaceful state of mind and bliss, from the serenity that this mint outdoor area provides. Not many properties can cater for extra outdoor parking space. And if your one that enjoys the magnificent waterways that bless the Sutherland Shire? Then this house provides that additional parking area for your water toys or second vehicle. Also accompanied by a single car remote lock up garage with internal access, this property keeps displaying features of convenience for any proud homeowner. Located nearby Sutherland train station and town centre, residents of this well situated home, have easy access to public transport, local infrastructure, schools, restaurants and other public amenities. 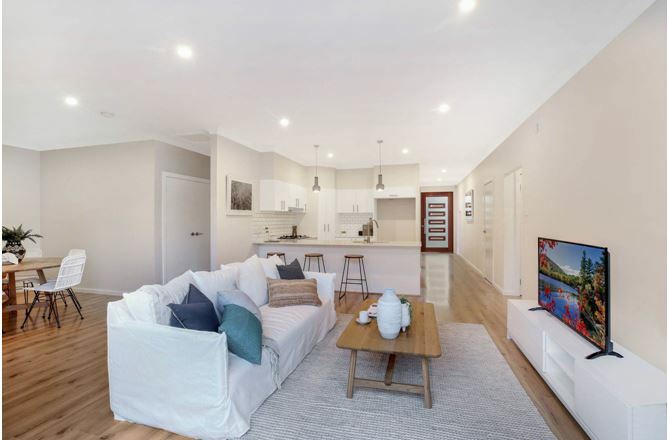 To find out more about this fantastic property and inspections times please go to the property’s webpage here or give Chris and Sebastian a call now on (02) 9545-2220. Hill & Viteri Property “Helping People through Real Estate” your Local Estate Agents in the Sutherland Shire.